1st Class £3.60 to the UK & Europe, £4.95 to the rest of the world. 2nd Class: £2.52 to the UK & Europe, £2.70 to the rest of the world. 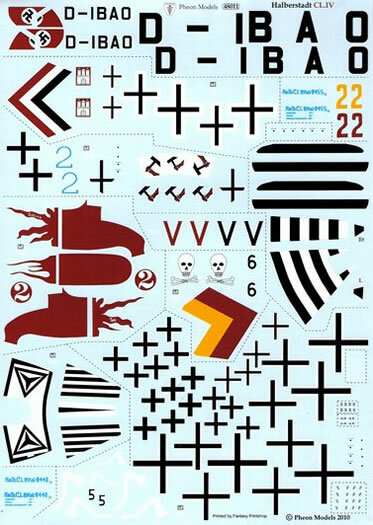 Pheon’s more recent decals have been released to complement new kits coming to market. This set is intended for the injection-moulded Halberstadt CL.IV from Polish company Karaya, which has been well received by the WWI modelling community. The CL.IV came late in the war, reaching the ground attack Schlachtstaffeln from June 1918 onwards. It was scarcely larger than a single-seater and was relatively manoeuvrable. Approximately 800 were built. 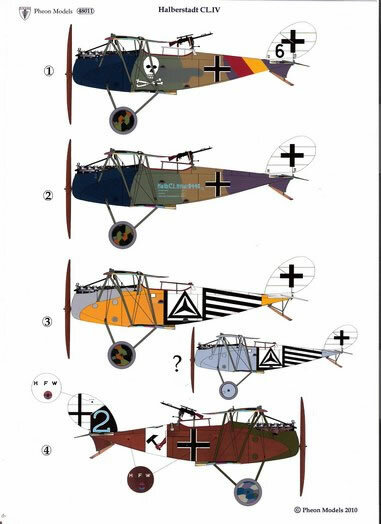 The Halberstadt CL.IV makes an excellent candidate for after-market decals as the colour schemes and personal markings are really colourful and interesting. 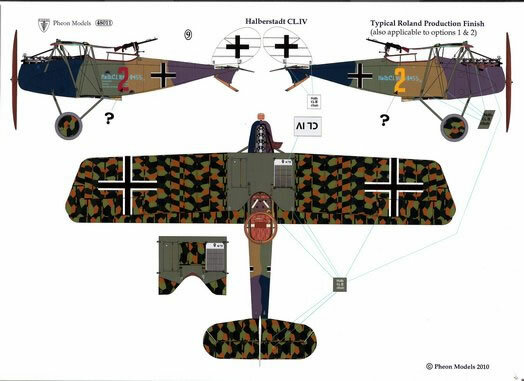 Karaya’s kit comes in three different versions: the long fuselage variant manufactured by Roland which Karaya do in two boxings, German & International, and the short fuselage variant manufactured by Halberstadt. 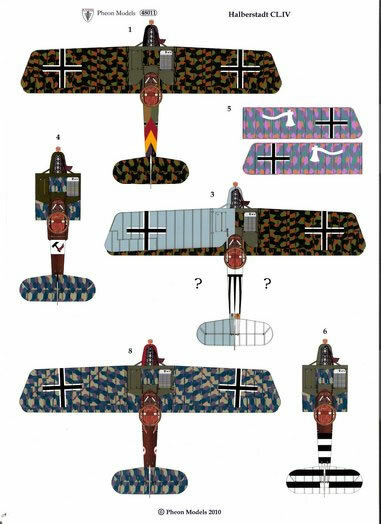 Pheon’s decal set includes 11 options covering both the long and short fuselage versions. 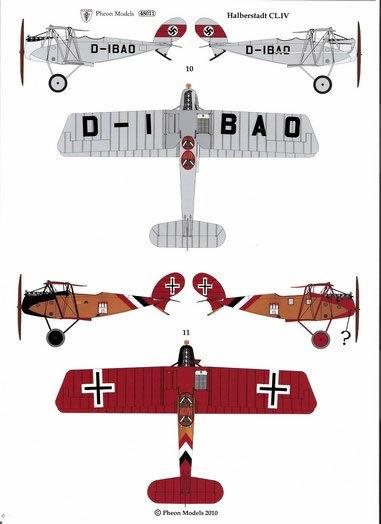 Two of the schemes are for post-war civilian aircraft, one operated by the Hamburg Polizeifliegerstaffel on anti-revolutionary duties in 1919-20 and another flown on photographic survey work up until 1938 and features Nazi insignia. Tiny werke numbers are included, as are Roland serial and weight tables in pale blue. One of these Roland logos has been slightly smudged; not a major issue as there are two pairs of these decals and with a bit of judicious cutting and swapping, the smudged section can be replaced. One of Pheon’s markings options is the same as one of the two kit (#1002) options – the ‘arm with hammer’. Pheon’s version of the arm & hammer is more detailed and in three colours, whereas the kit decals are merely a black silhouette (see the side-by-side comparison). 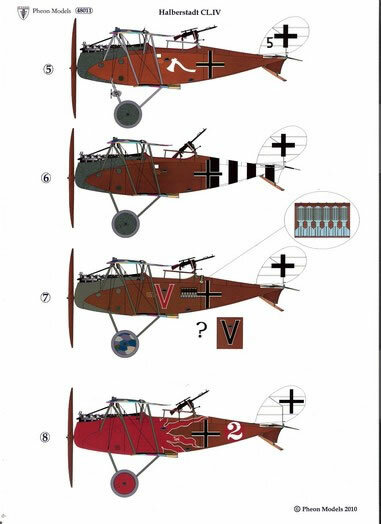 The white-outlined red flame markings on option 8 are quite spectacular (note this was operated by Schlasta 26b not 27b). Pheon admit that a number of the schemes are conjectural, but the reasoning for their chosen approach is set out in the instruction booklet and it is clear that a lot of research has been carried out. Alternative colours are included for some of the markings. In some cases the Pheon schemes differ from earlier representations in the Windsock Datafile. The set includes custom-designed templates for constructing a jig to aid with assembling the wings with the proper stagger and alignment. The template is printed on two A4 sheets of self adhesive paper for applying to thick card or board. I am sure this will simplify construction for the most challenging step when building biplane kits – nice touch. 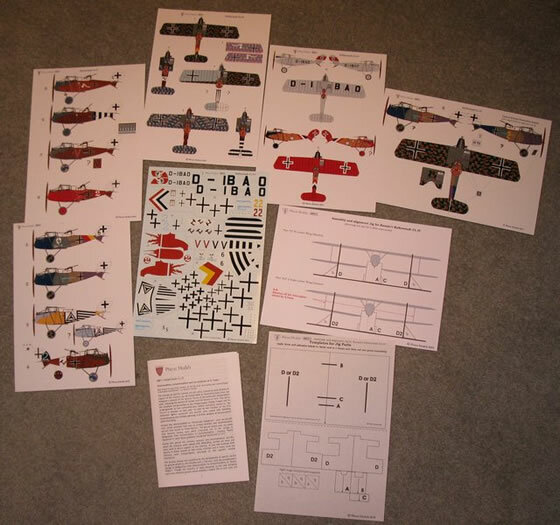 The 14 page A5 sized booklet follows Pheon’s standard layout: an interesting service history, comments on the kit, general colouring notes, references, decal application guide and service history for each aircraft and pilot where this is known. Marking options are featured in full colour on five A4 sized sheets of glossy photo paper showing decal placements (side profiles and top views). This set provides some really eye catching options for Karaya’s kit that will certainly set your Halberstadt CL.IV apart from the OOB models. Thanks to Pheon Models for the review sample. Ordering is by email directly to Pheon mailto:pheon.models@hotmail.co.uk. Thanks to Pheon Models for the review samples.